Diggers Valley: 1 August 2009. The week beginning the 1st of August 2009. 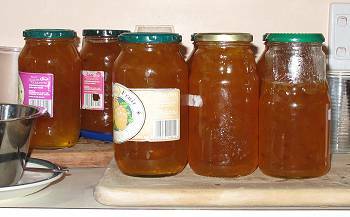 I did some website catch-up writing while Stephan made a cheesecake and marmalade. After lunch I gave the young heifers their Lepto vaccination. We discovered that our intended guests for cheesecake-sharing would not be able to join us, so we took it, and some other food, with us to Elizabeth and William's for a very pleasant evening catching up with family. A sunny, cold day. 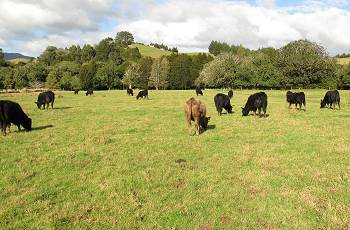 I moved the heifers this afternoon and they went galloping off down the paddock, kicking up their heels, looking great. Have a look back at the "this time last year" pages and see what it looked like in the same paddock in the same weeks last year! They were so miserable, wet and muddy, and thin. This year they're drier, warmer and better fed. 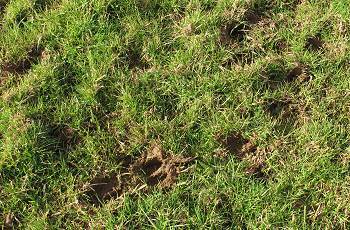 The ground is soft, as is to be expected, but it's not sodden and pooled with water. Last winter was utterly awful; I still feel traumatised by it and enormously thankful that this year's winter has been so blissfully easy. 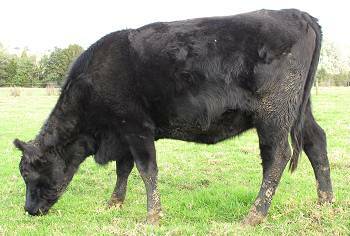 It would not surprise me if nearly all of the yearling heifers achieve the minimum mating weight this season! Isla, Imagen and the bull had their Lepto vaccine today and that's the whole herd done for the year. 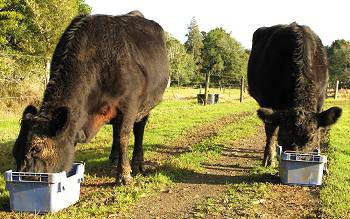 I gave Isla and Imagen their molasses and Magnesium in the lane before moving them out to new grazing. The orangey colour of the hair on Isla's neck is probably a sign of her copper deficiency. Colour fading that far down the body won't have been caused by the sun. In about three weeks they can have another copper injection. The hair takes at least six weeks to show any change. The mud on her face is her own addition. I spent a few minutes stroking Isla this afternoon and her calf kicked my hand several times, so things seem to be ok in that department. Goodness knows if we'll end up getting through calving successfully this year with Isla and a live baby. These two are the elder sisters of yearling heifer 605. 539 on the left, is the heifer which last year required treatment for retained afterbirth, but successfully got back in calf again within very good time after antibiotic treatment. 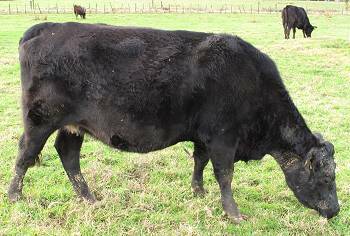 561 is one of the three R2 heifers calving for the first time this year. In order of age they are the daughters of Arran 20, #26 and #43 respectively, so I have an interesting mix of pedigrees in there. 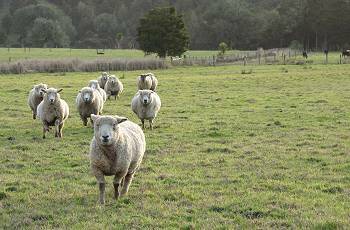 Mustering the sheep here is still very simple. We stand at the gate and call them. We no longer even have to use a bucket with maize in the bottom, for they will run to a hand clap and a call from us, then follow us wherever we take them. 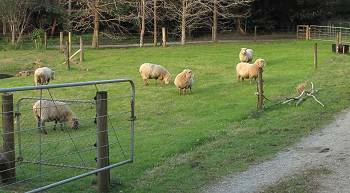 I wanted the sheep to graze the little holding paddock by the driveway where we sowed the last lot of rye. The grass came up slowly and looked very lovely, but it hasn't really grown terribly much. A lot of the soil there was brought and spread from somewhere else, and perhaps lacks fertility and microbial life. The pond at the bottom of our garden attracts shags. 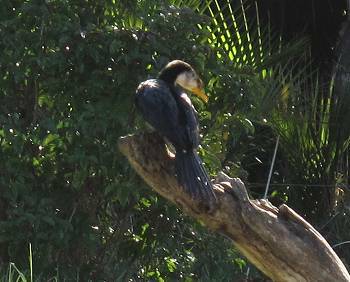 Sometimes this species, which I think is the Little Shag, Phalacrocorax melanoleucos and at other times the Little Black Shags, Phalacrocorax sulcirostris come in and see what might be on offer in the water. Maybe they're here more often than I notice and that's why I haven't heard any frogs for a while. We went to Whangarei today for an appointment and a little casual shopping and stayed the night in Jill's house. Jill arrived back in the country this afternoon and is staying with my sister Jude for a couple of days, until I go down and pick her up. 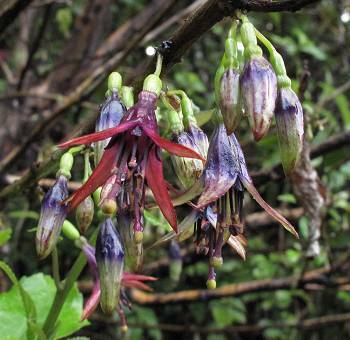 Flowers of the tree fuchsia, Fuchsia excorticata, I discovered last year on the side of the Mangamuka Gorge road. The flowers are really only a couple of centimetres in length - less than an inch - but they're so pretty. I managed to grow a cutting from this tree last year. We've been driving around in the ute for the last couple of years without a radio, thinking we'd have to get the device fixed, but never quite getting around to it. We both enjoy being able to listen either to the radio or recorded music when driving and so we found a car stereo vendor in the telephone directory, and discovered he could install one while we were in town this morning. Being a ute, there's only room for a speaker in each door, and because we live on a dusty road, there isn't much point in having anything exceptionally fancy, so we spent less than I had thought it would cost and now we have sound again! After buying a couple of CDs in town, Stephan headed home in the ute and I went south in Jill's car. My destination for the night was Pip and Tony's place in Kaukapakapa, friends initially made through my involvement with my favourite internet discussion forum. Their daughter, Alex, won the Isla competition a few years ago and they came up for a lovely weekend with us that summer, Alex's choice of competition prize. Alex got ripped off, really, because we'd been trying to get them to come up for ages! 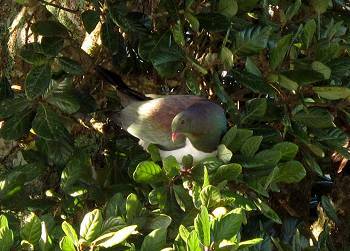 A Kereru (Kukupa in my part of the world) in a Taraire tree, outside Pip's house this morning. I left Pip's at around 3pm and headed for Auckland. 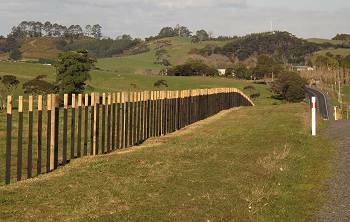 Just before I reached Huapai, a small settlement along the way, I noticed this extraordinary fenceline in the sunshine. I drove on past and down into the township, but turned around at the first side road and came back up the hill: it was one of those once-only views! The fence is perfectly straight and evenly constructed and the sun was causing every post or batten to throw a shadow on the next.